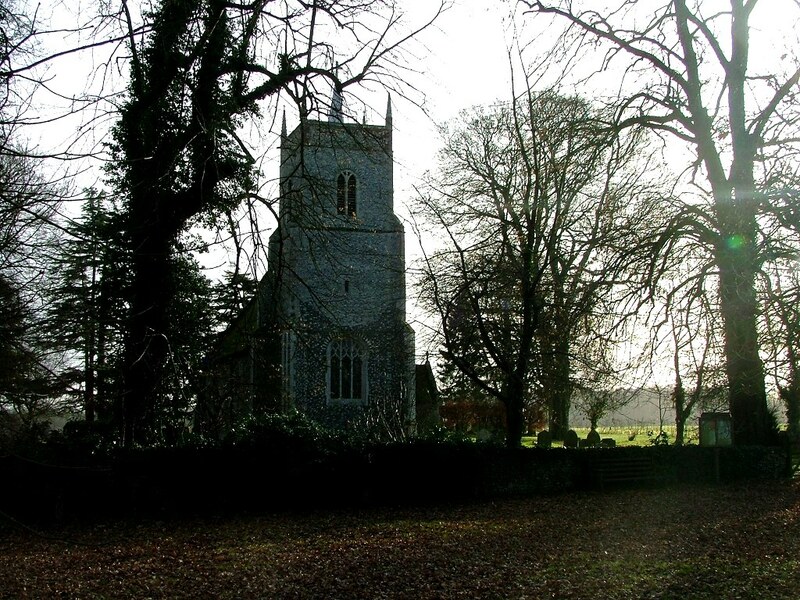 This church is most attractive in its setting, shadowed under big trees on the edge of the village green. Fields roll beyond the graveyard, large black birds arcing and wheeling above the greening furrows. 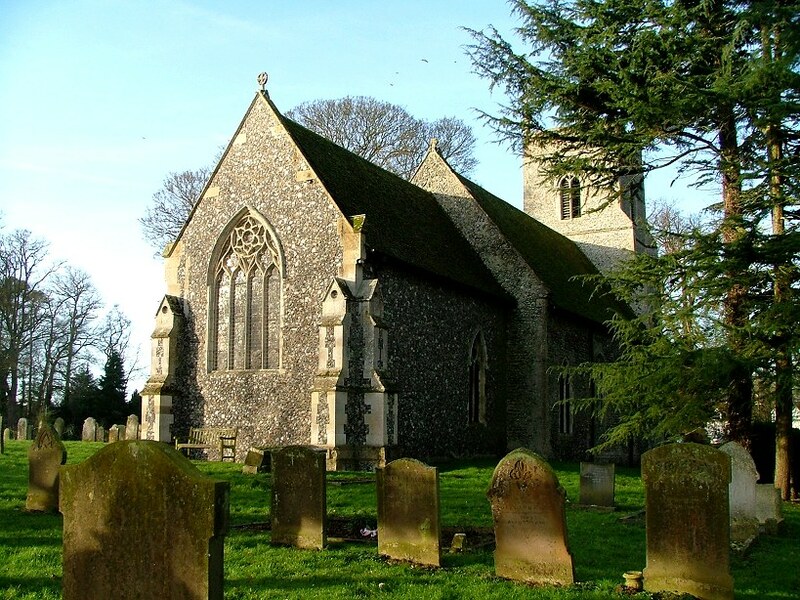 I had passed St Peter several times before; it sits on one of the main roads from Norwich to the west of the county, and I had become used to seeing it in early morning and late afternoon lights. 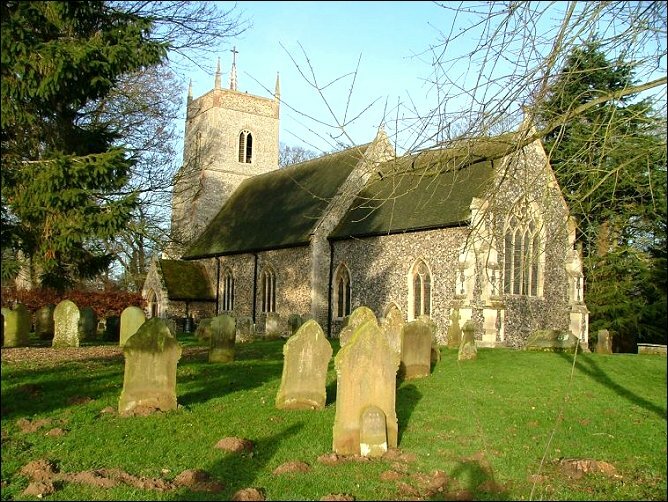 Heading into west Norfolk and back, I had come to think of it as a landmark, and I wondered what it might be like inside. The tower is late, rebuilt on the eve of the Reformation, giving it that big Tudor west window. The top part is even later, of course, and, along with the park lodge to the south of the building, it tells us something else about St Peter. This is an estate church, and the family at the Big House took its patronage of the building and parish seriously. They were the Wodehouses, and in 1631 they repaired the tower and topped it out with the fashionable geometric pinnacles of the day, and a central spire a bit like a font cover. 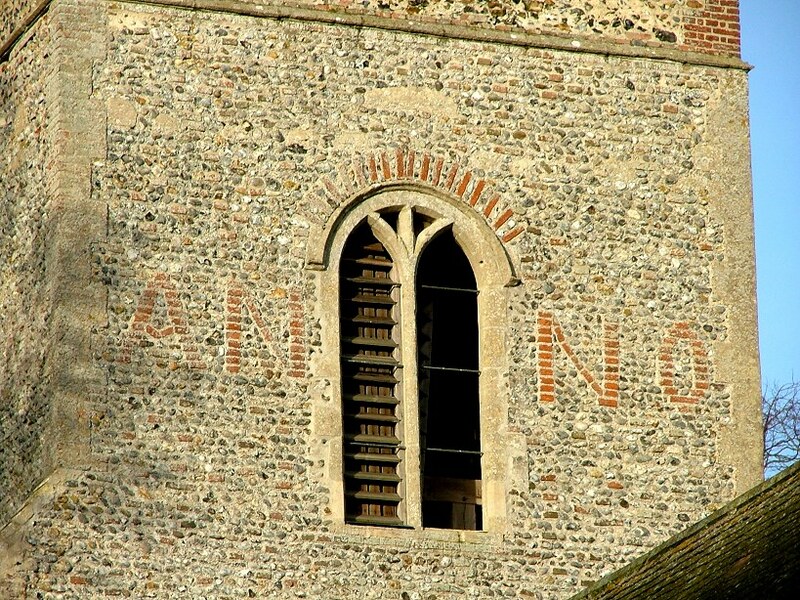 An inscription giving the date of the rebuilding is picked out in massive red-brick letters on all four sides of the tower, like an advertising hoarding. If you walk around the outside of the church, do be careful of the steep drop at the eastern end of the graveyard, especially if you tend to walk backwards away from a church like I do. 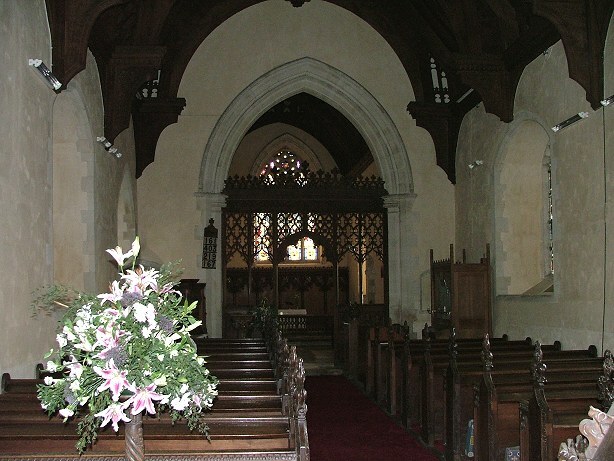 Externally, you might think that the chancel is largely 19th century, and in truth there was a considerable restoration here; but the church is still of interest, and this is in no small way due to the Wodehouses. Entering the darkened interior, I was reminded that this is a small church. 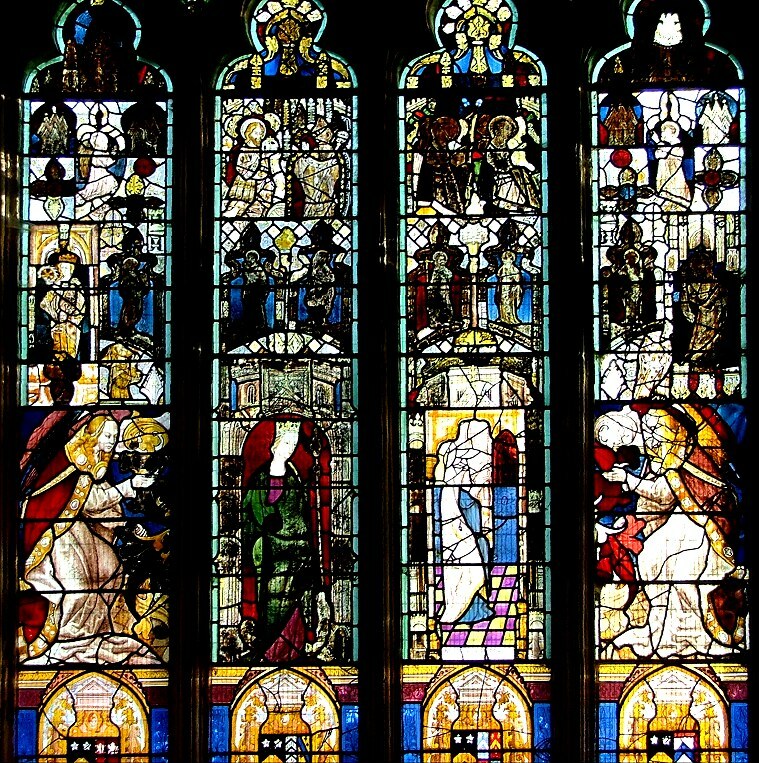 The windows are not big, and they are generously filled with glass, most of it 19th and 20th century. Almost all of it is good, and placed in memory of various Wodehouses. The best is probably the Risen Christ in the south of the nave. 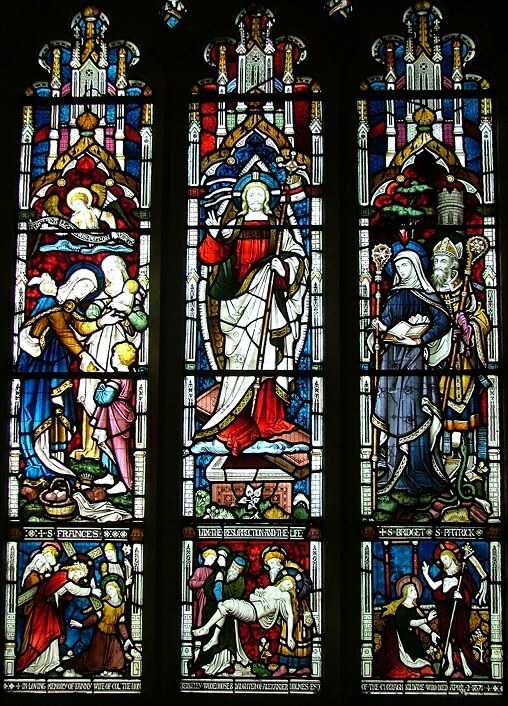 In the frieze along the bottom it features three scenes in the Passion sequence that are less familiar in 19th century Anglican stained glass: Christ carrying the Cross, the Deposition from the Cross and the Noli Me Tangere scene with Mary Magdalene. 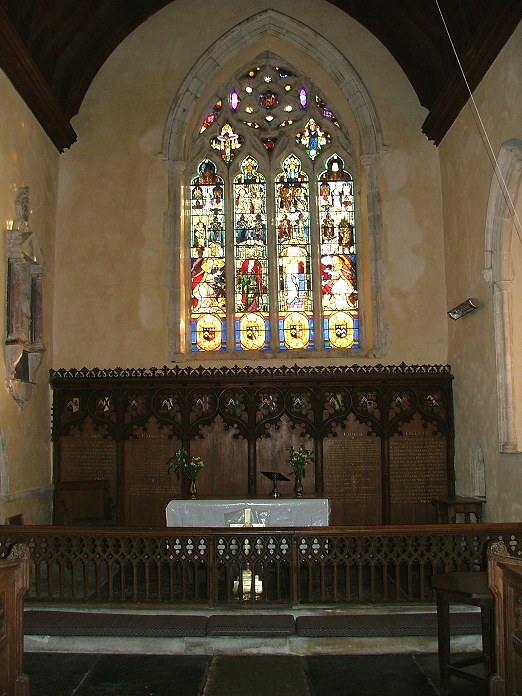 Even more unusual is that the risen Christ is flanked on one side by the rare St Frances (she is also at North Wooton), and on the other by the Irish Saints Bridget and Patrick. 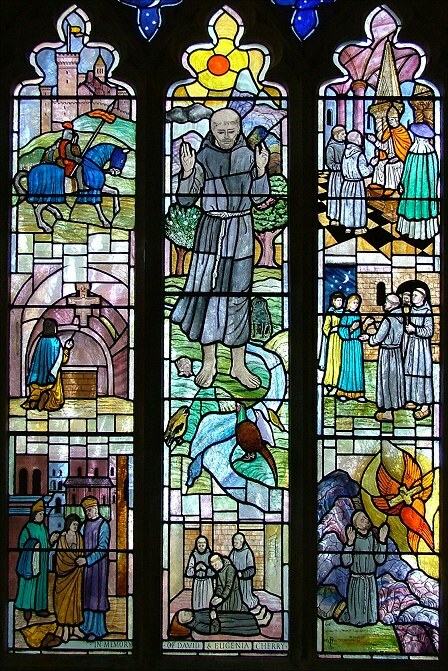 There is also a very good 1950s window telling the life of St Francis. But the finest glass, and what makes Kimberley famous, is in the chancel. 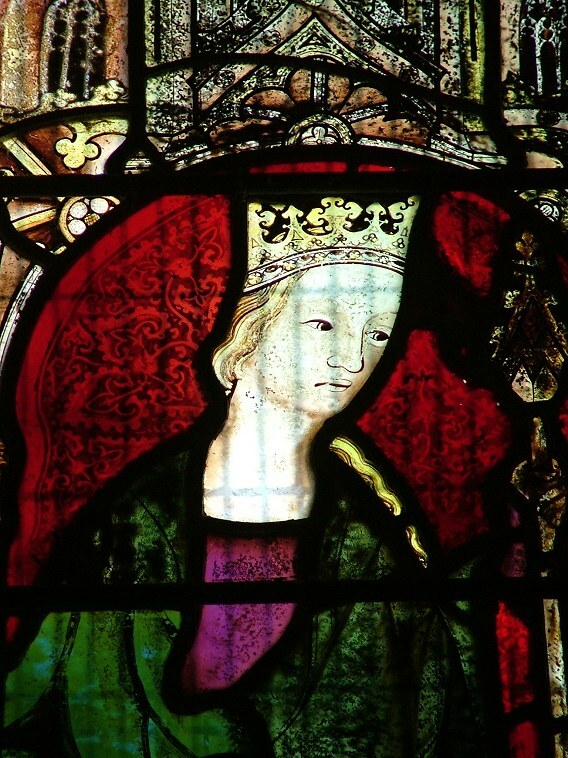 The east window is a patchwork of English and continental glass of the 14th and 15th centuries, full of life and quite a contrast with the austere sanctuary. It was placed here in the early 19th century by the Wodehouses. Quite how much of it came from this church originally is debatable. As was fashionable, the seriously rich antiquarian-minded squires of the time would often travel to Flanders and Germany, buying up old glass from monasteries closed by wars and the French Revolution. Usually, they would install it in the Houses, and then bequeath it to the parish church in their wills. However, it is unlikely that the Wodehouses did this. 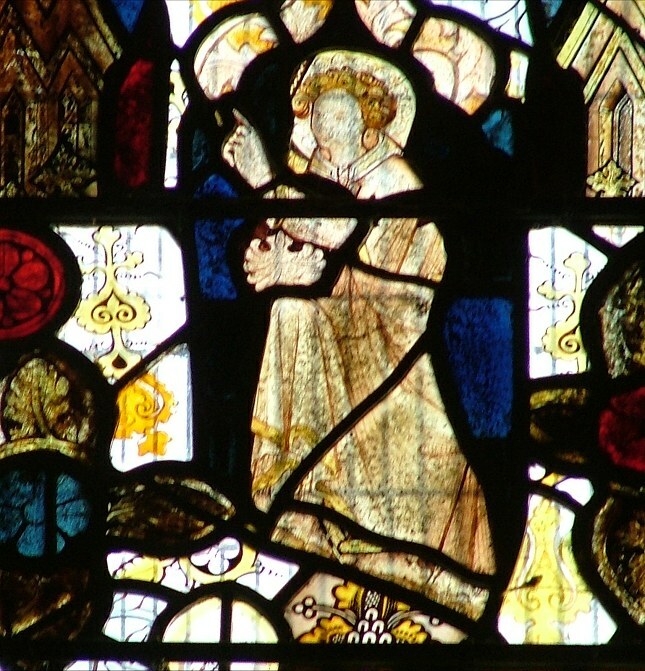 Just as it became fashionable to collect old glass, so it became possible to buy it from several English suppliers. 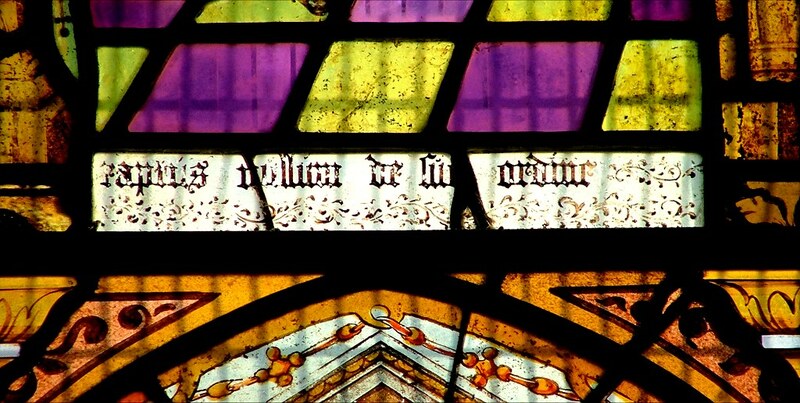 We know that the Wodehouses gave the more famous glass to Hingham church for the east window there, and, as is often the case in Norfolk, they did not have to leave the country to do this. 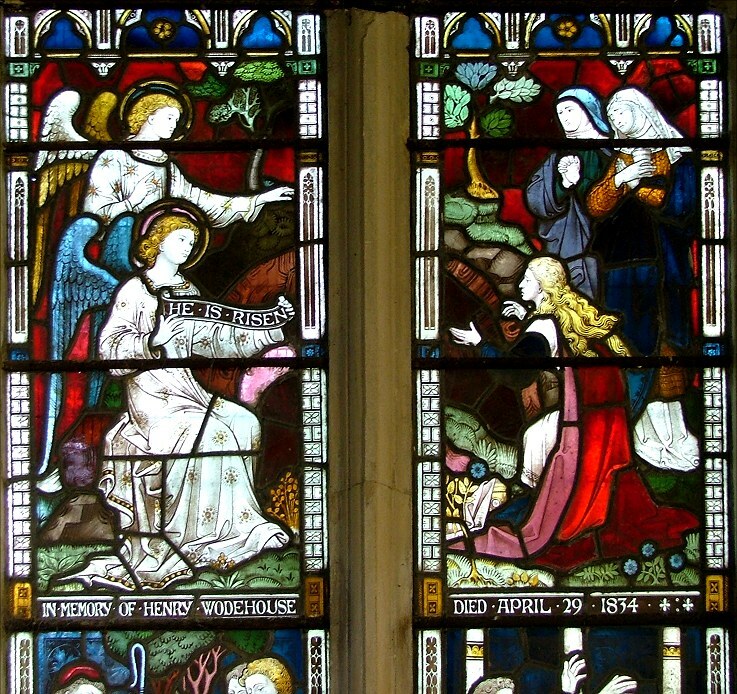 Almost certainly, the glass in both churches came from a Norwich merchant, JC Hampp, who dealt widely in that kind of thing, and was installed in the 1820s by Samuel Yarrington, a stained glass artist who made a living installing antiquarian glass for display. 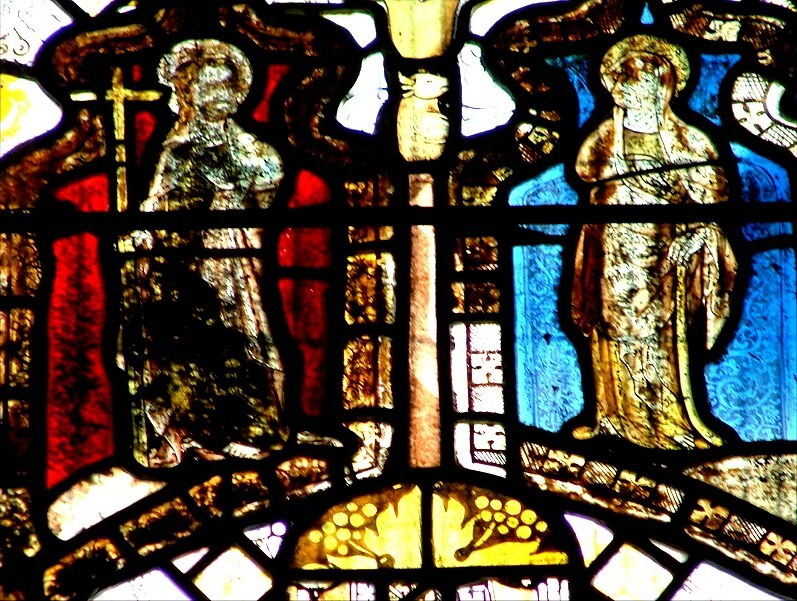 These two men were also responsible for the provenance and installation of a lot of foreign glass in churches in the Loddon area. 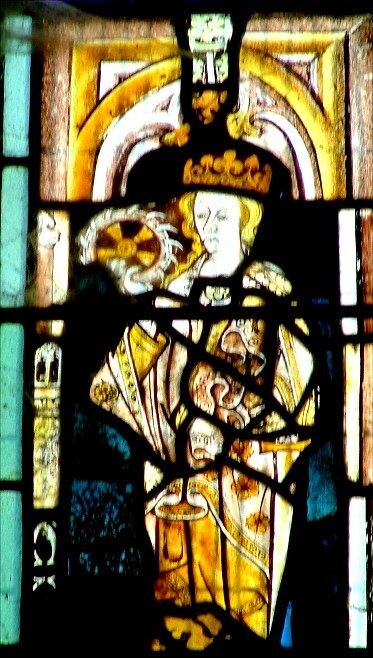 It may be that the English glass here also came from Hampp - or, perhaps, it is Kimberley's own. It is rather dirty now, and not in as good condition as that in some churches, but it is a remarkable collection and there are plenty of recognisable figures. The smaller ones, mostly 15th century and about 20cm tall, include a fine St John the Baptist, a St Catherine, and the pairing of St Philip and St James the Less with the bull of St Luke climbing between them. The larger figures are slightly older; the best is probably the crowned figure (a queen?) wearing green robes. You can click on the examples above to see them enlarged. As I said earlier, the 1870s restoration was really quite extensive, and included the complete rebuilding of the chancel arch. 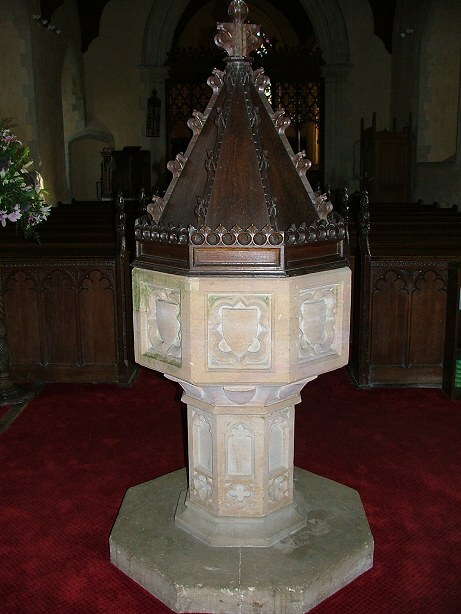 A lot of the medieval features were removed, or at least neutered by being crisply recut, and the font was replaced. 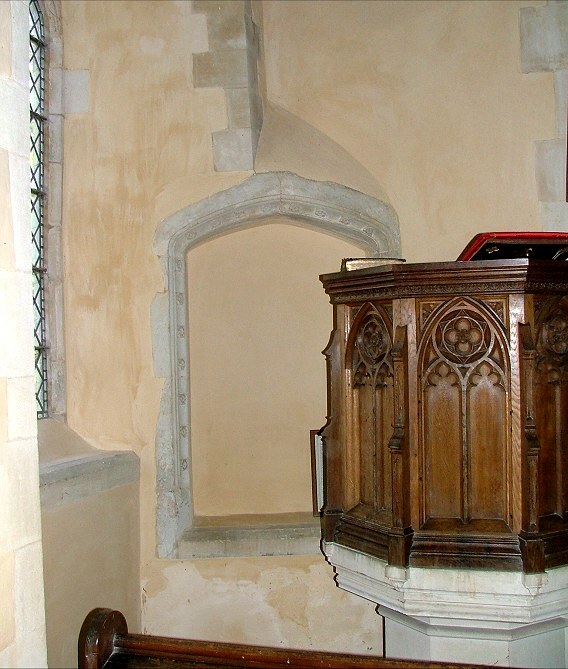 However, the former entrance to the rood loft stairs is not without interest. It is set in the east wall of the nave to the north of the chancel arch, and although it has been truncated at the bottom and turned into a large niche, it still retains the fleurons around its flattened Tudor arch. It may be contemporary with the rebuilding of the tower. 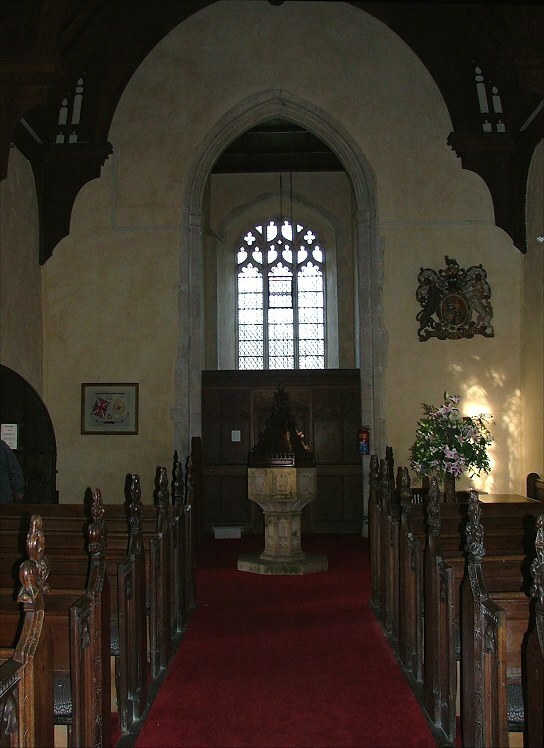 To the north of the window is a late 17th century memorial to Dame Elizabeth Strutt, daughter of the Woodhouses who rebuilt the tower. She kneels facing east, her back slightly arched, rather more alive than most figures of this period. 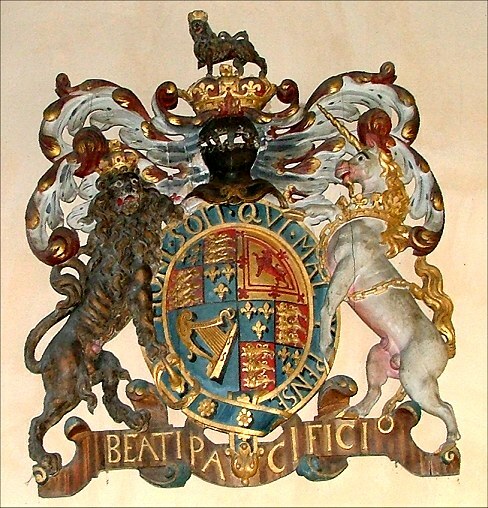 Even rarer, at the west end of the church is Norfolk's only set of royal arms to James I that carries his motto Beati Pacifici - 'Blessed are the Peacemakers'. The Scottish monarch chose this legend in 1603, at the time when he was pressing his claim to the English throne in an attempt to unite the two kingdoms. How intriguing to think that it must have been placed here by optimistic churchwardens on the death of Elizabeth, perhaps hoping for better times to come. If they had known what the following century would bring, perhaps they might not have included the motto. Indeed, if James had known, he might have chosen a less naive one. Reading about this church in the literature after visiting, I realised that we missed the Wodehouse brass under a mat in the chancel. 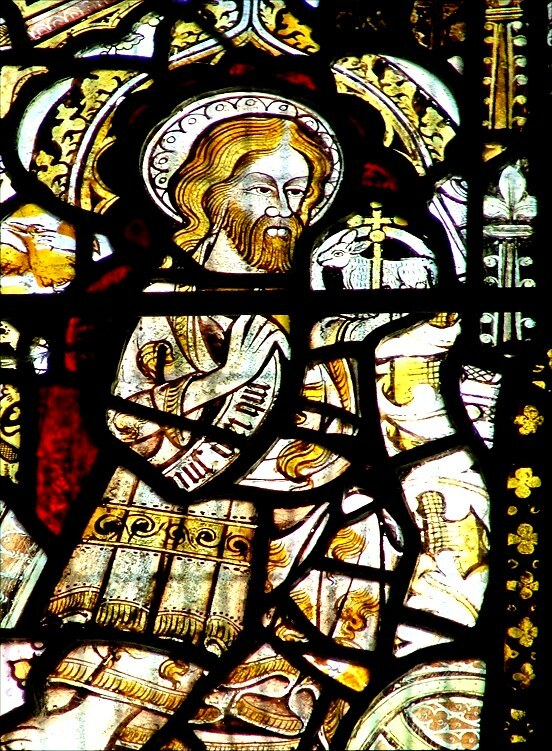 A reminder to me not to be hasty, but also a good excuse to go back and visit St Peter, and to wonder again at that east window.